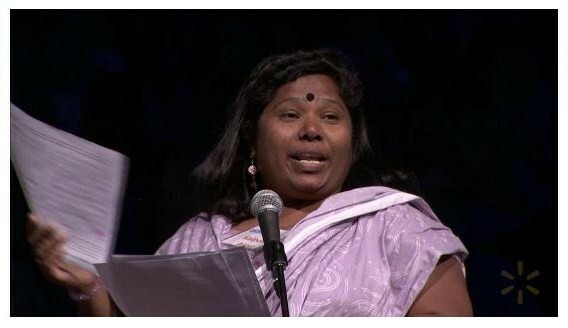 This past Friday, Kalpona Akter, of the Bangladesh Center for Worker Solidarity (BCWS), addressed Wal-Mart shareholders at their annual meeting to present the NYC Pension Funds’ shareholder proposal for Wal-Mart Supplier Human and Workers’ Rights Reporting, with the support of New York City Comptroller John C. Liu. You can listen in on her empowered speech here (you’ll have to move ahead in the video—she addresses the shareholders from 2:14:30 – 2:19:22). You can also hear from Akter in a recent interview on Free Speech Radio News. As we have reported, Akter is facing a potential life sentence, even possibly the death penalty, on what she says are fabricated charges from an alleged Wal-Mart subcontractor, among others. Why is Wal-Mart such a big player to have on board in the struggle for decent work in Bangladesh? According to Akter, 12-15% of garments made in the country are produced for Wal-Mart. What’s more, of the 11 cases filed against labour activists as a result of the large-scale protests last year, 4 have allegedly come from a Wal-Mart subcontractor. This entry was posted in Consumer Education, CSR, Education, Equal Rights, Fair Trade, Fast Fashion, Forced Labour, Freedom of Association, Harassment or Abuse, Health and Safety, HIDDEN NARRATIVES, Hours of Work, Human Rights, Labour, Overtime Compensation, Political, Responsibility, Social, Social Conditions, Social Responsibility, Student Education, Supply Chain, Torture, Transparency, Tutor Education, Wages and Benefits and tagged Bangladesh Centre for Worker Solidarity (BCWS), John C. Liu, Kalpona Akter, New York, NYC Pension Funds, protests, shareholders, Wal-mart on June 5, 2011 by Mary Hanlon.